POSITION SUMMARY: Reporting to the Manager, the Autism Support Assistant is responsible to ensure that the day to day support provided to people diagnosed with Autism Spectrum Disorder meet the expectations of those supported persons to enhance his/her quality of life. The support provided must also align with the values of Kerry’s Place Autism Services and meet the goals and expectations of the agency. The Autism Support Assistant, with his/her team, provide service aimed at maximizing health and safety and personal fulfillment of people diagnosed with ASD. Kerry’s Place offers a competitive overall compensation package for our full time permanent employees which includes but is not limited to: paid Vacation; paid Personal Sick Leave; and additional paid Flexible time; employer paid group Health and Dental benefits; and the employer matched Pension Plan. We also provide developmental and training opportunities such as Nonviolent Crisis Intervention (CPI), Autism Spectrum Disorder specific training, CPR/First Aid etc. Be familiar with and consistently apply the principles of Kerry’s Place Autism Services with respect to the Mission, Vision, Values, and Policies and Procedures. Demonstrate a strong work ethic and act according to Kerry’s Place Autism Services Employee Performance Standards demonstrating respect for all people. With the staff team, use creativity and resourcefulness to ensure that the quality of life principles are effectively applied for the people. Every effort must be made to enhance and maintain the person’s dignity and respect. Provide solutions to barriers impacting achievement of quality of life. Participate to ensure Personal Outcomes for people are met as defined by each participant. Know and understand what each of the goals are for each person. Implement the actions to support people to achieve the goals identified in his/her Person Centered Plan. Provide appropriate supports, tools, etc to ensure the health and safety of the people supported. Ensure compliance to Policies and Procedures associated with Health and Safety and Abuse Prevention. Consistently follow, where appropriate, Behavioral and Crisis Protocols as documented. Document and report Incidents and Serious Occurrences immediately. Provide support and coaching in the areas of: social skills, communication, vocation and leisure activities. Ensure the work area is clean and safe; correct or report any safety concerns immediately. Document and report Accidents, Injuries and Near misses immediately. Use Kerry’s Place Autism Services resources in a cost effective and efficient manner. Ensure accuracy and timely completion of documentation for legislative and policy and procedures requirements, such as: individual’s files, health records, Person Centered Plans, data collection, etc. Ensure appropriate confidentiality is maintained for supported persons, families and other employees. Develop and maintain positive relationships with: families, natural supports, volunteers, professionals, community members and other people you interact with in the course of your work. Attend and participate in meetings as directed by your Manager or Residential Coordinator such as team meetings, family meetings, etc. On an ongoing basis, ensure mandatory training requirements are met and attend any training and development sessions as directed by your Manager or Residential Coordinator. The Autism Support Assistant may from time to time be called upon by the Manager or Residential Coordinator to perform other duties. Administer medication according to the Kerry’s Place Autism Services Policy and Procedure. Understand the purpose of each medication, the expected effects and maintain vigilance for the potential side effects. This position supports adults over 18 years old. Completion of Ontario Secondary School (or equivalent) and 1 year of related experience (preferably supporting people diagnosed with Autism Spectrum Disorder). Nonviolent Crisis Intervention (NVCI) certification from the Crisis Prevention Institute (CPI) and the ability to perform physical techniques. Solid communication skills both oral and written. Strong interpersonal skills and demonstrated ability to work in a team. Demonstrated flexibility, creativity and sound judgment. Self-motivated and demonstrated ability to motivate others. Must have the ability to physically support children, youth and adults with Autism Spectrum Disorder. Must have the ability to complete the NVCI certification as well as perform the required physical techniques. Training will be provided. In addition to a competitive compensation package, we focus on health and wellness including fitness and family- focused benefits and work life balance. 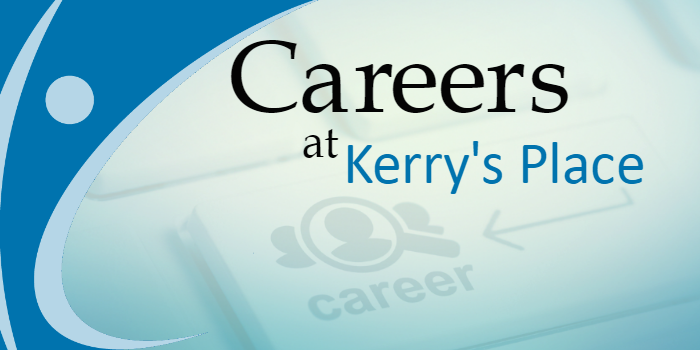 Kerry’s Place is an equal opportunity employer and is committed to diversity and inclusivity in employment and welcomes applications from all qualified persons. Kerry’s Place is also committed to providing accommodations for persons with disabilities. If you require an accommodation, we will work with you to meet your needs. This position is open to Internal and External applicants. Only those selected for an interview will be contacted. We thank all applicants for your interest in Kerry’s Place Autism Services.